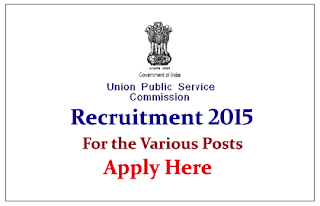 Union Public Service Commission is recruiting for National Defence Academy and Naval Academy for various posts for the year 2015. Interested and Eligible candidate can apply online here on or before 17th July 2015. The Union Public Service Commission (UPSC) is India's central agency authorized to conduct the Civil Services Examination, Indian Forest Service examination, Engineering Services Examination, Combined Defense Services Examination, National Defense Academy Examination, Naval Academy Examination, Combined Medical Services Examination, Special Class Railway Apprentice, Indian Economic Service/Indian Statistical Service Examination, Combined Geoscientists & Geologists Examination, and Central Armed Police Forces(Assistant Commandant) Examination. Eligible candidates can apply online on or before 17.07.2015. For more details kindly check official Notification.